I’ve been trying to make some new recipes lately to get us out of our dinner rut. It’s hard to do with an infant but there are recipes that are pretty quick to make and taste really good. Most of the recipes I’ve been making have been winners but there have been a few that I won’t try again. 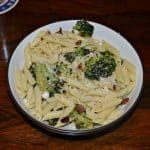 My favorite recipes have been those in the Instant Pot or pasta recipes. 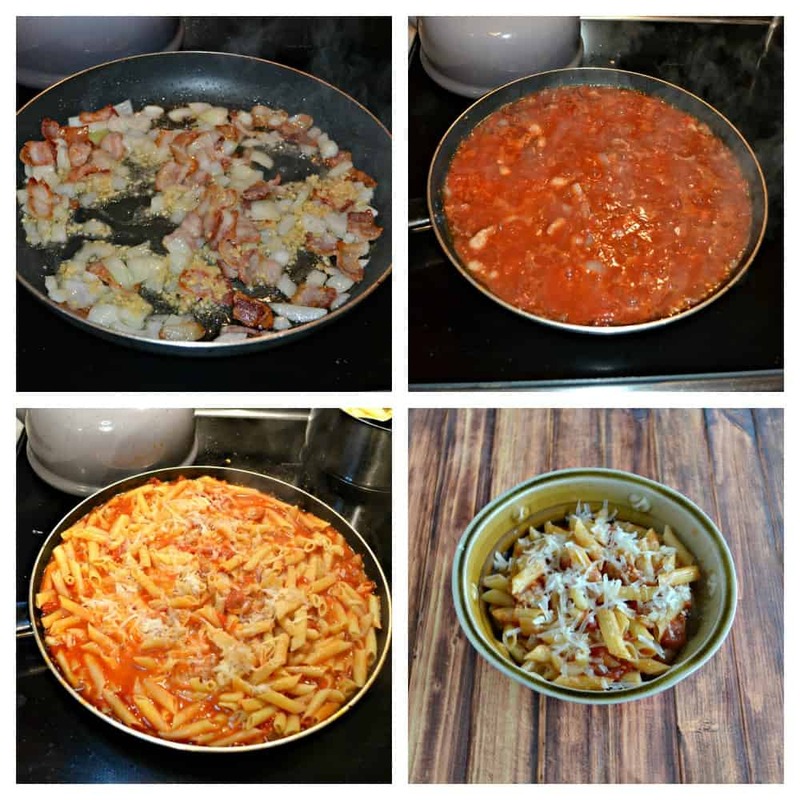 Many of my pasta recipes have a red sauce on them. While I am a huge fan of red sauce, sometimes it gives me heartburn. I also can only have tomato based meals a few times a week before I’m over it so I’ve been looking for recipes that aren’t tomato based. 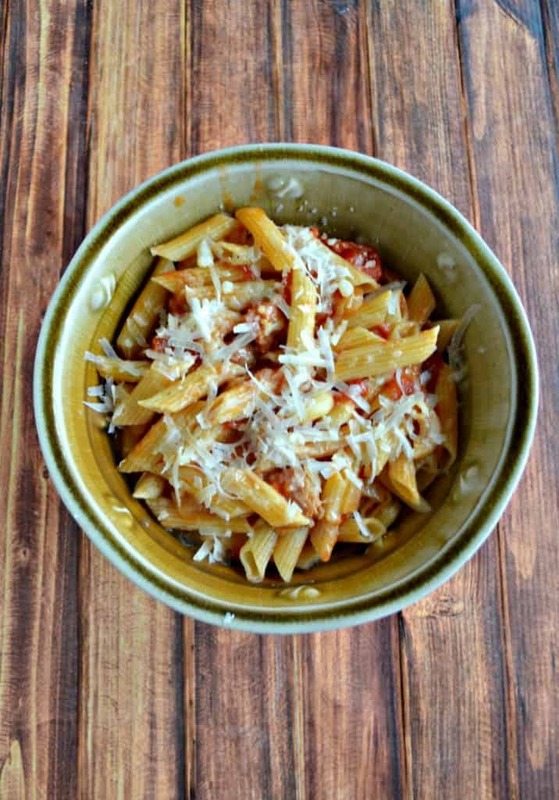 This Penne with Bacon, Onion, and Balsamic Vinegar has tomatoes in it but that isn’t the overwhelming flavor in this dish. I love the combination of the salty bacon with the fragrant onions, and a hint of sweetness from the balsamic vinegar. It’s an interesting but delicious combination of ingredients. While the original recipe called for pancetta I simply used bacon. I live in a small town and sometimes it’s hard to get more specialty foods. Pancetta is one of the foods I have to drive to get and I just didn’t have the time to do it so bacon it was. 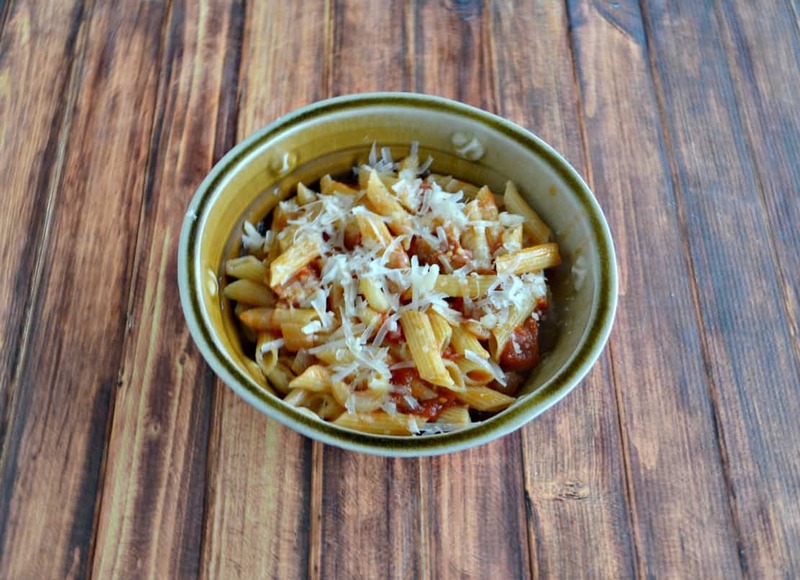 This meal cooks up fairly quickly which makes it a great weekday meal. I usually have most of the ingredients on hand as well. 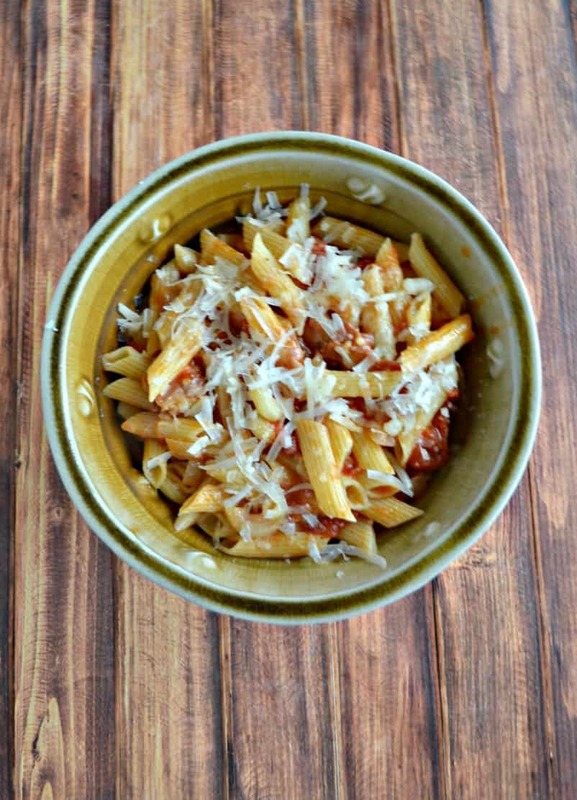 Make sure to use the Parmigiano-Reggiano in this recipe as the salty bite of the cheese really makes this meal. 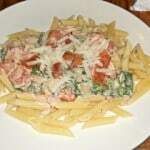 Don’t skimp and use grated Parmesan! 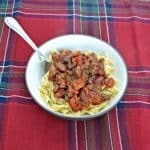 A delicious pasta cooked with bacon, onions, tomatoes, and balsamic vinegar then tossed with Parmigiano-Reggiano. Heat a large pot of water over medium high heat and cook the penne pasta according to the package directions. Drain, reserving 1 cup of pasta water, and keep warm. Heat the bacon in a large skillet over medium heat. Cook for 5-7 minutes, stirring occasionally, or until it begins to brown. Add in the onions, garlic, and sugar, and saute for 4 or 5 minutes. Add in the chicken stock and vinegar and cook, stirring frequently, for 5 minutes. Add in the tomatoes and cook for 3 minutes, stirring to break down the tomatoes. Let the sauce simmer for 10 minutes. Stir in the salt and pepper. 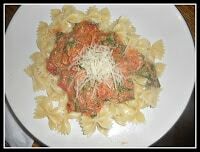 Add the pasta to the sauce along with ½ cup of the reserved pasta water. Toss to coat the pasta. Add in half of the cheese and mix well to combine. Serve in 4 bowls along with the remaining cheese as garnish.